*If you use homemade chicken stock instead of broth from the store, you may need to increase the amount of salt in this recipe. Just taste in the end and adjust to your liking. In a 4 quart heavy-bottomed pot or dutch oven sweat the leeks, ginger and garlic with 1/2 teaspoon salt for about 3 minutes. Add the curry paste, stir it around into the leeks, and roast an additional minute to develop the flavor. Add the sweet potatoes, chicken broth and remaining salt to pot. Cover and bring it up to a gentle boil. Cook for 20 minutes or until the potatoes are tender and falling apart. Check the liquid level occasionally to make sure it is not drying out. Once the potatoes are done, remove the lid, and using the back of your spoon, break up the potatoes to a chunky consistency. 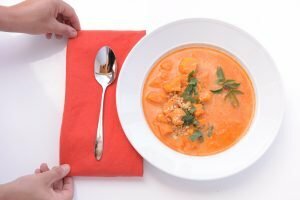 Ideally, you’d have an even amount of smooth sweet potato along with sweet potato chunks. To finish, stir in the coconut milk and the lime juice. Serve very warm with lots of herbs and peanuts sprinkled over top.